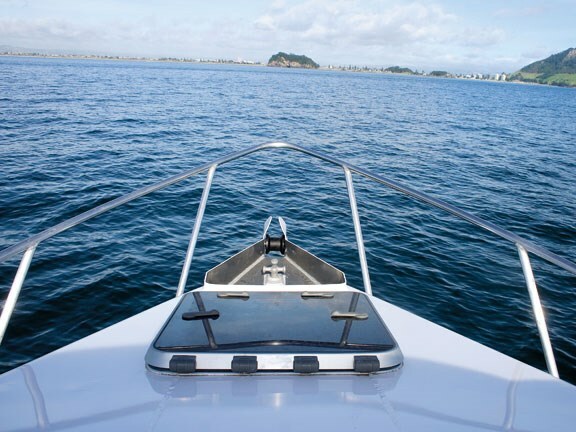 Sportcraft Boats is one of New Zealand’s largest manufacturers of aluminium boats, with an annual run between 160 and 200 boats under its Scorpion and Bluefin brands. 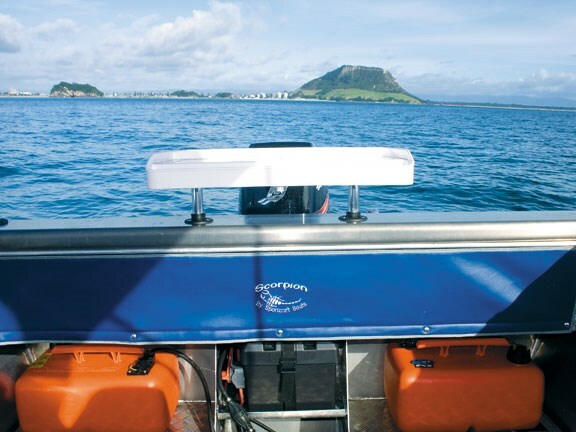 The range includes everything from small dinghies to the largest Scorpion to date – a 10m commercial crayfish boat. 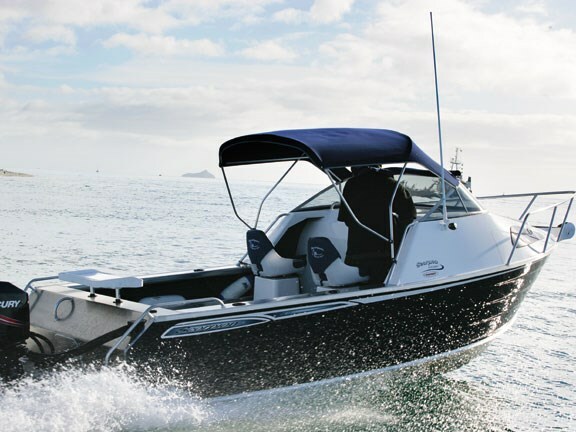 Sportcraft prides itself on being able to offer a good quality boat at a sharp price – which is achieved in part by an efficient and streamlined production system. This Scorpion 610 is eye-catching and the quality paint job is complemented by the matching bimini top, graphics down the side and tinted cabin windows. The interior is basic but functional, with plenty of useable, easily cleaned space available. There are plenty of options to consider, and the team is happy to fit them to suit. Up front there is a fully lined cabin, which is cosy and provides a safe-haven to store gear and the kids when needed. It features comfortable, full-length bunks with storage beneath. The cabin entry is a bit tight, but this does give it a snug feel. An optional infill squab, portable toilet and cabin curtain are available to further increase the family appeal. 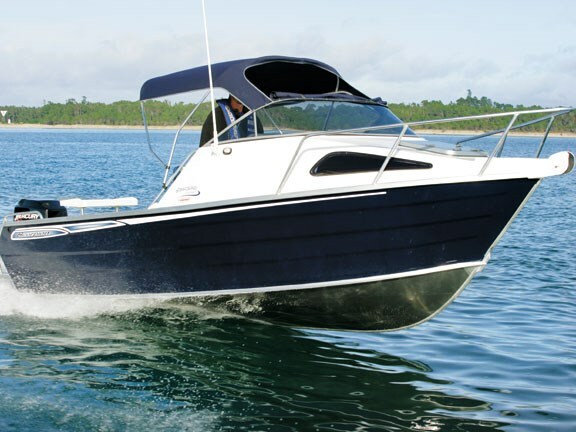 The gunnels are wide and of a good height to keep the rug rats secure, and the bimini top provides good shelter from the elements while not encroaching on the fishing space available. Access to the anchor is through the front hatch, with the anchor itself located in an open, self-draining anchor well. A large roller and anchor guide help to get the anchor dispatched and retrieved with minimum effort, but the anchor guide is a little over protective and care is needed to slip the anchor between the guides without scratching the paint. The cockpit design provided plenty of open space to cast soft-baits around with ease. 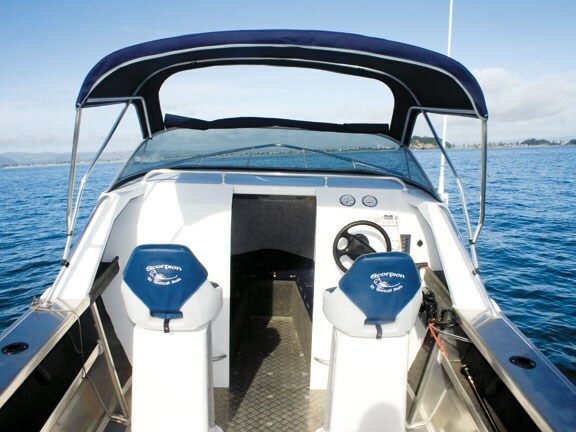 Wide gunnels and swivelling seats allow all parties to rest the feet if desired and the four rod holders were adequate for two anglers, although more serious anglers would be advised to option in more. Serious fishoes with more expensive equipment will appreciate the fully lined parcel shelves that run the length of the cockpit. The transom features a large, sturdy bait board with a cleverly positioned removable anchor light. LED navigation lights are also included. Divers will find the twin tread plate duckboards with grab rails to their liking. The port side features a sturdy boarding ladder with a second grab rail. 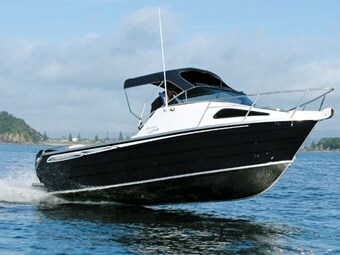 The transom lacks a door but is easily straddled once onboard. The tread plate floor, removable tote tanks and raised battery shelf are all easy clean options, and carpet or floor matting can be optioned in. The floor is fully sealed, providing the 850 litres of under-floor buoyancy – but the trade-off is no under-floor storage or under-floor fuel tank options. There is ample space, however, for two 45-litre tote tanks and up to two upholstered fish bins across the stern. At the end of a messy fishing session the interior can be simply hosed out. The console is fairly basic but systematically laid out. All the gauges are in easy view, with the steering wheel and throttle in comfortable reach. Both the driver and passenger get foot rests and side grab rails, with a full-length grab rail located on the dash for good measure. 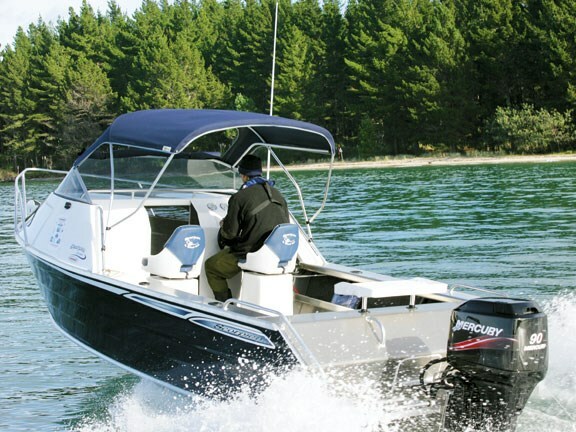 The Scorpion 610 comes standard with a Hummingbird fishfinder and there’s a heap of space on the cabin top to mount a GPS and numerous other electronic devices. Lined side shelves provide a good place for possessions and the VHF is handy. The wind built to a steady 20-knot breeze and with the chop coming from an annoying front quarter angle we took some spray over the windscreen and into the cockpit. There are not many boats this size where it would be any different in the same conditions and it was easily fixed by closing the bimini top. Once we turned the corner and attacked the chop head on we were able to comfortably cruise at 23 knots without having to touch the throttle. Spray wasn’t a problem into the head sea and there was no need to stand to get a better view as the windscreen provided good visibility while seated. The gull wing hull needed a bit of a nudge to get up and planning but once on the plane it provided a soft and stable ride. Turns were tight thanks to the down-turned chine and the non-feedback steering was smooth and more than adequate – rated to 200hp. Gull wing hull designs need a decent amount of power to push them, and the two-stroke Mercury 90hp made sure this Scorpion did still have plenty of sting in its tail – producing a top speed of 34 knots at 5400rpm with two people on board. Although lumpy at low revs (due to the large cubic capacity and three-cylinder configuration) it provides good responsive power when required. It’s also budget-friendly in terms of capital outlay and servicing costs. Sportcraft also manufactures its own trailers. The Sportline single-axle, multi-roller trailer – complete with submersible LED lights – makes launching and retrieving hassle-free. With its family friendly cabin, easy clean interior and appealing price tag the Scorpion 610 will be an attractive option to young families and serious fishermen alike. You pick whether you use it for overnight adventures, family excursions off the beaten track or to put food on the table. See Scorpion boats for sale.